Fat Free, Calorie Free Cupcakes! A while back, I received an e-mail from a cupcake enthusiast, a fellow blogger in Norway named Christel Jensen. She was testing out my grapefruit cupcakes with chai icing and had a question about the ingredient list. She casually mentioned that she created some yummy cupcakes of her own, so I visited her blog. “Every day is a cupcake day:) Vanilla cupcakes with fresh strawberry butter cream. With a lovely ripe strawberry on top. Can we ask for more?” she said next to one of the photos. But it’s ok to indulge here. 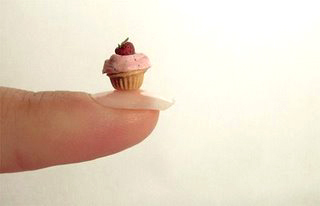 Have as many of Christel’s kind of cupcakes as you like, because they make up an astounding collection of hand-made miniature food, crafted completely out of polymer clay. Christel constructs these sweet scenes, inspired by cupcakes as well as other foods of yesteryear. 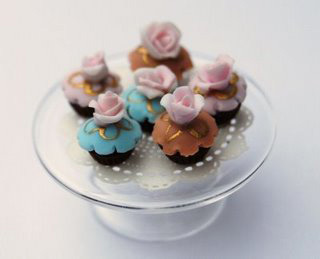 You’ll see old-time Americana baked goods decorated with miniscule imitations of sugar roses, chocolate jimmies, and coconut flakes, all resting atop replicas of 1930’s Depression glass cake pedestals or just nestled inside white cake boxes fitted with paper doilies. It’s clear that her love of cupcakes, in particular, runs deep, as one clicks through 19 adorable blogs dedicated solely to cupcakes from her incredible inedible collection. I giggled and grinned as I viewed a tiny yet abundantly filled cheese cart, decked out with tools and supplies to impress any wine and cheese aficionado. The scenes she creates are charming ones, some that even show cakes yet to be iced next to metal decorating tools, a bowl of thick butter cream, a full pastry bag, and even an impossibly small bottle of red food coloring. Looking at these creations reminds me that food is multi-faceted. I have always been intrigued by the other side of food, where it ceases to be a necessity and becomes something else. Just in the case of other artistic mediums, like photography, styling, and food writing, food feeds the mind first but still inspires the belly. And because our eyes eat too, it’s easy to communicate the spirit of entertainment or celebration with this art along with other cultural aspects that food undoubtedly carries with it. Thank you Christel for sharing your big love of cupcakes made so small. Christel Jensen is really a great artist.